The 'Little Water Whale' long-sleeved bibs are made of water-repellent material and perfectly suitable for children from 6 to 24 months. 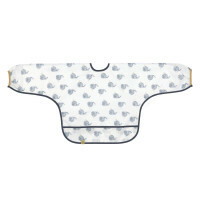 Product information "Bib Long Sleeve, Little Water Whale"
description & equipment Perfect all-round protection for small blob and cookie monsters – the long-sleeved bibs from LÄSSIG’s Little Water baby collection with the magical swan and little whale motif. The water-repellent material and the integrated flip pocket make this bib an all-rounder for meals as well as for painting and craft projects: The clothing underneath remains clean and dry, perfectly suitable for children from 6 to 24 months. 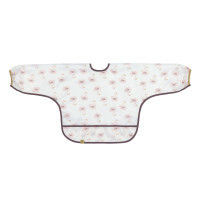 The bibs are machine-washable at 30 °C.